THR was the first to report on the news. According to them, Fox recently acquired the rights, and is now in talks with all involved parties. It will reportedly be a live-action/animation hybrid, with a script written by McKenzie, one-half of the hilarious musical act Flight of the Conchords, who also wrote the award-winning music for The Muppets, as well as its sequel Muppets Most Wanted. Pretty safe to say that the adaptation is in good hands. In addition to having a role in the film, Depp will also serve as producer. The actor can currently be seen in the Whitey Bulger biopic Black Mass. His upcoming starring films include Yoga Hosers, Alice Through The Looking Glass – both are out next year – and Pirates of the Caribbean: Dead Men Tell No Tales, which will hit theaters Summer 2017. As for Wright, his last directorial effort was 2013’s The World’s End – which closed out the Blood and Ice Cream film trilogy. He is currently in preproduction for Baby Driver, which stars Ansel Elgort (The Faults In Our Stars, Divergent), Lily James (Pride and Prejudice and Zombies, Cinderella), and Jon Hamm. This wouldn’t be the first time Gaiman’s work was adapted. Stardust and Coraline had big-screen versions, and Joseph Gordon-Levitt and David S. Goyer are producing the long-gestating Sandman. 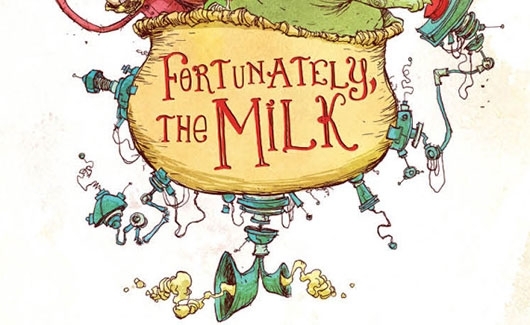 Gaiman’s children’s book is described as “a story of time travel and breakfast cereal.” It starts out with a father who goes to the store to buy some milk and returns with wild tales of aliens, space-time travel, pirates and more. Animal Logic Entertainment, the team that brought us The LEGO Movie, will be producing. So it should be interesting to see what they will bring us since this will be a live-action/animation hybrid. At the very least we will get a very whimsical and entertaining film, thanks in part to three very talented people who are involved.